Its not been bad really, I do get to meet with some lovely people and socialize for a change- something that shocked my system a bit, but it turns out its like riding a bike, you don't forget how to do it, which was a pleasant surprise!! 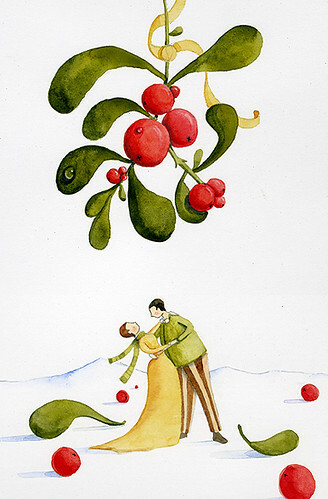 I was considering right yesterday to wander around with my head crowned in mistletoe (is it how you call the plant with red fuits that make peolpe kiss, isnt it? )so that my boyfriend stops getting angry whenever I'm late with everything and I mess up all our programs..and is forced to do something more interesting! Have a nice day, you're in good company with Plato I think. Lovely card Maya, good to see some of your work again. Hope the graphic design job goes well! That card is stunning, the colours are beautiful, so clean and crisp, and the positioning of the berries, perfect!. Niiiicccce. Very, very nice. Woodmansterne. Hello again maya, I have just added some links to our blog, including yours, I hope that is ok.
Everyone is so lovely...I'll b blushing till next year! Thank you for adding me to your links!